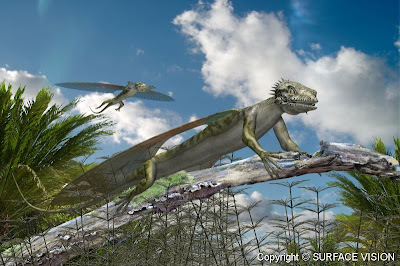 Life Before the Dinosaurs: Coelurosauravus. 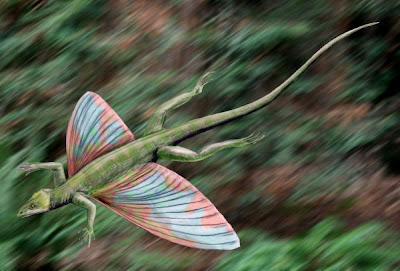 If this creature used these 'wings' to facilitate hopping from tree to tree (my conjecture), some idea of what the contemporaneous tree species were like might be interesting to explore. I say this by way of thinking aloud that the blog is called "life before the Dinosaurs," not "Animal life before the Dinosaurs." Something to think about, not a criticism by any stretch; quite to the contrary, in fact. I mostly write about animals, but I've also written about organisms in other kingdoms. I've written about the fungus Prototaxites, the protist group Fusulinida, and the plants Sigillaria and Archaeopteris. I mostly write about time periods like the Cambrian and Ordovician when plants were mostly microscopic algae and small seaweed. There's a lot of different types of Cambrian algae that I might want to post sometime soon. Maybe I'll write about some more Paleozoic plants.